This controversial 335 meters high elevator was started building in September 1999 and put into operation in April 2002. It is claimed to be the highest and heaviest outdoor elevator in the world. 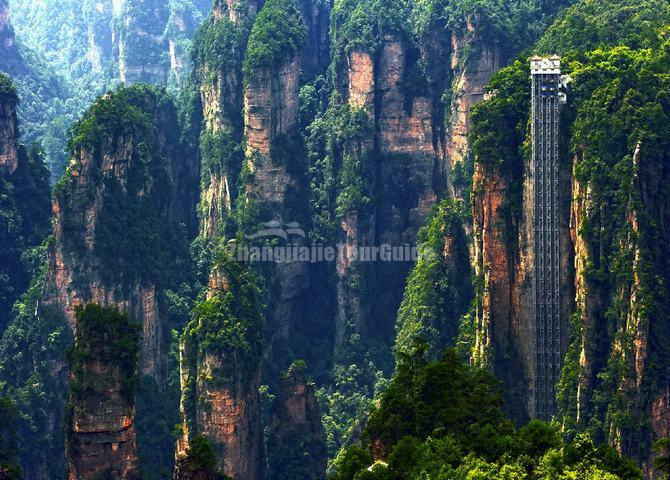 The Bailong Elevator has set three Guinness world Records - World's tallest full-exposure outdoor elevator, world's tallest double-deck sightseeing elevator and world's fastest passenger traffic elevator with biggest carrying capacity. It is formerly known as "Qian Kun Column" (The Pillar between Heaven and Earth) or Southern Sky Column. 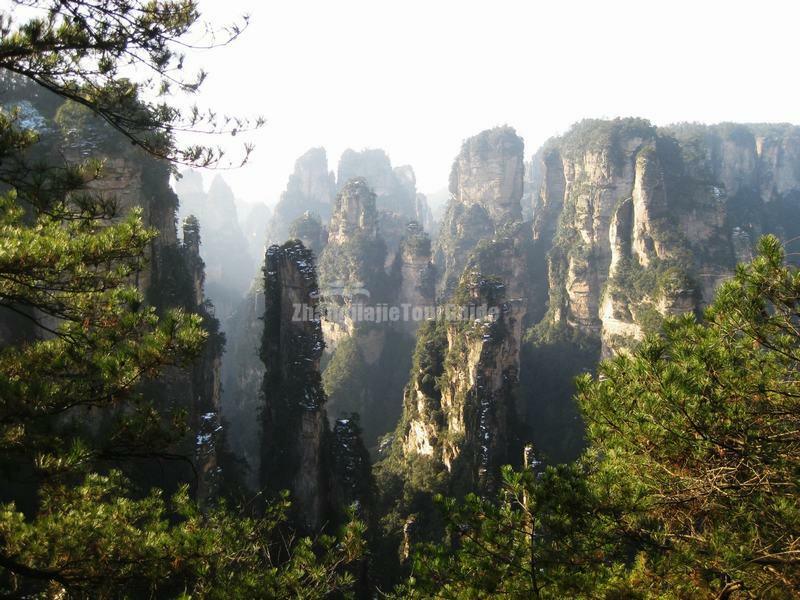 In January 2010, it had been officially renamed "Avatar Hallelujah Mountain" in honor of the eponymous film. The mountain has a strange shape, the vertical height about 150 meters, has a potential of indomitable spirit. Fascinate Platform gets its name for as long as you stand in this observation platform, the soul will be fascinated by the stunning landscape in front of you. You can have a myriad panoramic view when look around on the platform. This natural stone bridge, stretching across thin air between two mountain peaks, is 3 meters wide, 40 meters long, and 5 meters thick. It rises 357 meters above the valley floor. local people are accustomed to the adage," walking on this bridge will bring you good health and longevity." if you make a way along the bridge, your body trembles, your legs shake. So, clearly, this natural structure not only tests your pulse and blood pressure, but it also challenges your psychological state. The Backyard Garden is Yuanjiajie's answer to the Front Garden of the Yellow Stone Village, and is a typical Wulingyuan composite landscape consisting of freestanding obelisks and massive blocks set in deep ravines that radiate out with little pattern, with dense tree coverage on the floor of the ravines and with shrubs and trees growing out of every available nook and cranny of – as well as from the tops of – the obelisks and massive blocks (many of the trees growing on the obelisks and blocks come in dwarf sizes, giving the impression of a bonsai garden – they have obviously adjusted their growth to the limited nutrient supply available). 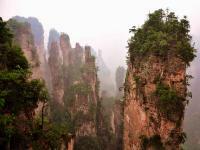 Shadao Valley is a deep canyon which the shape like "U". The wonders in the gully is assemble, full of wild phenomena; old trees and headstrong rattan, picturesque rocks and steep cliffs, all of these are stagger established. At the end of Shan Dao Gully, there is a spring water drift down from the cliff top of more than 200 meters high, just like a long white silk descend from heaven. Walk over 200 meters on the eastbound of the first bridge in the world, then turn southbound 150 meters, you will see a viewing deck which can see the scenic of double turtle crawl to the heaven. Walk 400 meters on the eastbound of the first bridge in the world, rock texture is densely covered in the opposite precipice, just like a "bluff Asgard picture". 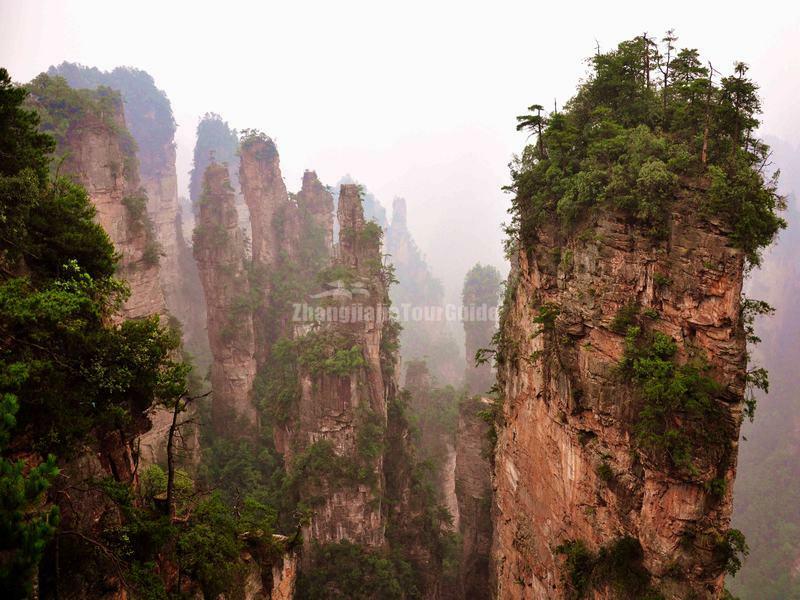 It is located in the junction of Zhongping and Xiaping of Yuanjiajie Scenic Area. The mouth of spring hole is about 1m high, two meters wide. It becomes wide after get into the hole, at its widest point is 90 square meters, the total length of 310 meters. 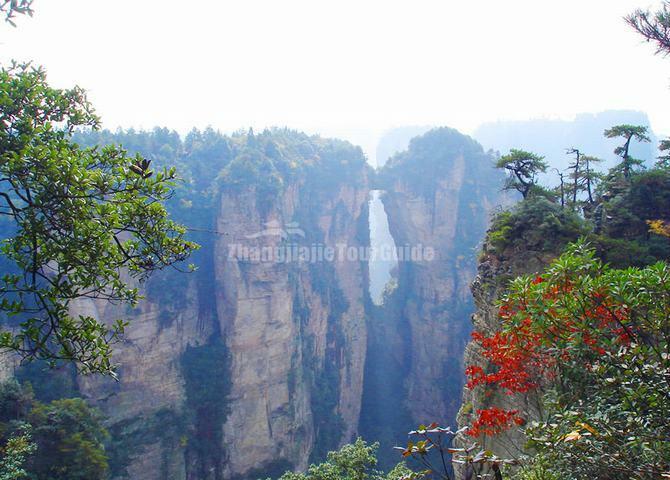 Walk over 1500 meters on the eastbound of Wulong Spring, there has a groove which depth of 4 meters, 3 meters high and more than 40 meters long on the wall of a rock. There is a eye of about 80cm in diameter on the groove, the spring water is flow out from there. There has a long and narrow stone groove in the hole which is 10 meters high, 2000 meters long, 0.4 meters wide, the visitors can only walk sideway into the hole. 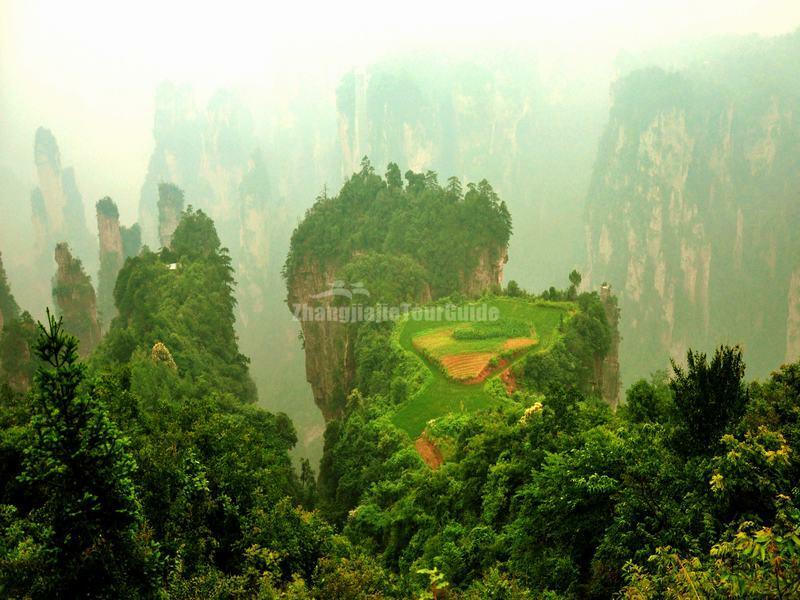 It is distant relative with the backyard garden of Yuanjiajie Scenic Area, at an elevation of 949 meters, the relative height of more than 949 meters, and the top area of 3 hectares. It gets its name for the lots of wild goats.